A homemade, paleo teriyaki sauce bakes on top of pork chops in this healthy yet flavorful recipe. So versatile it’s good for Sunday dinner or meal prep! This recipe is very easy to make: 4 pork chops, 4 pineapple slices & the homemade sauce. I used a fresh pineapple but if you use pineapple out of the can…that’s okay too. You can easily double or triple this recipe for a larger crowd. The size of the casserole dish you use will depend on the size and quantity of your chops. My 4 pork chops were approximately 4 ounces each so I used a 9×13. It’s okay if your chops need to overlap a bit to fit. The teriyaki sauce is homemade. I try to make all my own sauces & marinades versus store-bought. Most times it is actually cheaper AND the most important part is you control what goes in it. Meaning no added preservatives! Yuck. This sauce only contains a few simple ingredients that I bet you already have in your pantry. The sauce will thicken as it bakes. I like to drizzled some on top of my pork chops when it’s done cooking. If it doesn’t thicken to your liking then try adding a little more arrowroot starch to your sauce. Lightly spray a baking dish with cooking spray. Lay the pork chops in the bottom of the baking dish. Lay a pineapple slice on top of each chop. In a small bowl whisk together sauce ingredients and pour on top of pork. Bake 35 minutes in preheated oven, or until the internal temperature of the chops has reached 145 degrees F (63 degrees C). I haven’t tried to convert this recipe for the slow cooker yet. I have however grilled it. If you want to go that route, here are the grilling instructions. Same ingredients, slightly different instructions: In a small bowl whisk together sauce ingredients. 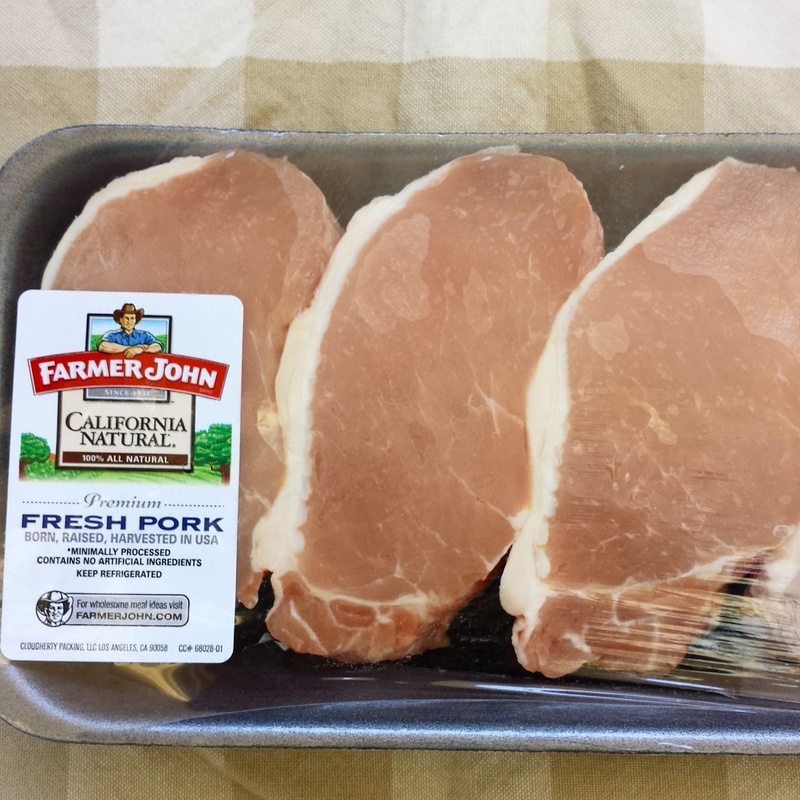 Place pork chops in a large resealable bag and cover with the sauce. Refrigerate 4 hours to overnight, turning the bag halfway through. Preheat grill to medium-high heat. Lightly coat grill with nonstick cooking spray. Grill pork chops until the internal temperature of the chops has reached 145 degrees F (63 degrees C). Add pineapple slices to grill and cook for 1-2 minutes on each side. Top pork chops with pineapple slice prior to serving. Like this recipe? Check out my Slow Cooker Paleo Teriyaki Pork Loin! Very tasty. And easy enough for a weekend cook! I used regular soy sauce and doubled the ginger, just because I like ginger. My family loved it! Yay! This comment made my day! I love your modifications, thank you so much for sharing. Ooh I love a thick pork chop. I would reduce the temperature to 325 and cook 4-45 minutes. Enjoy! Should this be covered with foil before baking? I did not cover it with foil. Enjoy! I tried this recipe “as is” with the exception of thickening the sauce with a cornstarch slurry before baking. When I tasted it, it was much too acidic. I had to “rescue” it by turning it into a sweet and sour dish by adding some brown sugar. Then I baked it as instructed. The chops turned out very moist and we renamed it Hawaiian pork chops. I think that, if I try it again, I would replace the rice vinegar with mirin, which is sweet cooking sake. I use the non-alcoholic type. Then the recipe looks much more like the teriyaki recipe I always use. I’d omit the pineapple and just garnish with some thinly sliced green onions. This was so yummy. I made it last night. I used pineapple juice instead of water and I also added a tsp of cornstarch slurry to the sauce then baked and it thickened nicely. Made this for dinner tonight. It was FABULOUS served on a bed of rice. Started with a side salad and some crusty bread. It was so easy and quick to prepare, it will become a regular in our line-up. Add a glass of your favorite wine and you’ve got a great start to “date night”. Making this tonight!! What would be a good side to go with it? Would love to try this with boneless chicken thighs. This I really goid! Super easy to modify for however many pork chops you need! We just loved this. It is just the two of us and I had two big bone in 1 inch thick chops. I used all the amounts for the 4 chops. It was PERFECT. Wow, really great recipe. Had to cook longer of course. Thank you. I love pork chops and am always trying to find a new a different way to cook them. So glad I tried your recipe. 5 star recipe. Wow. THANK you so much for the positive feedback. I’m so glad you enjoyed the recipe!